Sorata is the male protagonist of the story. 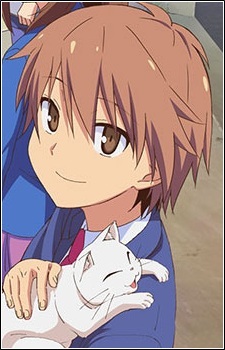 He is a second-year student of Suiko, who lives in room 101 of Sakurasou Dormitory. He was kicked out of the standard school dorm after he chose not to throw away a stray cat he picked up. As many of the Sakurasou Dormitory residents have outstanding grades and art skills, he often feels plain and normal among them. He is chosen by Chihiro to take care of Mashiro's daily life, although he resists at first, but he ends up getting used to it. In the third volume, Sorata realizes that he is in love with Mashiro. In the eighth volume, Sorata confesses to Mashiro. In the ninth volume, he and Mashiro officially become a couple. It is heavily implied in the last volume of the novel that Sorata and Mashiro had a child.